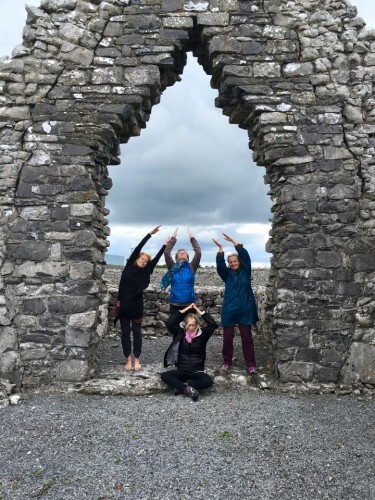 Reconnect and rejuvenate yourself in nature on a spiritual day tour in the Burren, where you can stop to meditate for a while at chosen sites, led at first by the deep resonating sounds of the gong. Learn to dowse ley lines and find water lines and and soak up the serenity of a secret landscape that few tourists find – the lesser-known sites of the Burren Lowlands. You can also benefit from Jackie’s interesting books on the Burren. We call our tours slow tours, or eco-wellness tours, and they last either a full or half-day according to demand. People can travel in convoy of personal cars by car-sharing, or hire electric bikes . For larger groups a small tour bus and driver is also available. The price is a reasonable €40 for a morning or €70 for a whole day tour (based on a minimum of four booking). Tours start in Kinvara. Enjoy lunch in the serene environs of Lady Gregory‘s old estate at Coole Park! Enquire here with your date for your therapeutic tour, guaranteed to be an adventure! If you want to be sure of joining these varied tours please contact Jackie in advance, as at times she will be away on a longer tour. 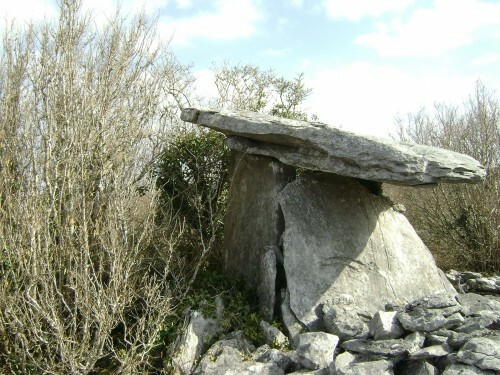 The deep meditative sounds of the gong and drum set the tone when played at a hidden dolmen, and we experiment with dowsing the energy field it emits. Learn dowsing at Kilmacduagh, where Ireland’s tallest round tower stands. Visit the wells and hidden oratories of St Colman who blessed this land in early Christian times. Visit caves and underground rivers and more… a day out of the ordinary awaits! I just wanted to say again just how much I appreciate your spending time with me. It was a beautiful gift of yourself & I feel enriched for having met you. That was the most peaceful place I've ever experienced in all my travels, and I've done many. The whole place exuded peacefulness; the rocks, the babbling spring, the sunlight through the trees. It's a perfect microcosm of peace and I'm going to remember it forever. It has entered me through and through. Thank you so much for taking us there. Jackie, everyone really enjoyed your tour yesterday - so thank you so much. All the group were delighted with where you took them. The locations were scenic and your information both interesting and entertaining. The visit to Yeats' home and your reading of some of his linked poetry were really first class.Thanks for a fabulous time in the fresh air and countryside! I highly recommend anyone seeking a unique insight into the Burren and its history to engage Jackie as their expert guide. Once again, thank you for taking my party of Californians round the Burren Lowlands. I'm still reflecting on all the inspirations you left me with. It's days after that I begin to realize you're doing really special work. Climbing up and down the rocks with you was probably the most special experience I had in Ireland. It was such a awesome experience with you. I'm so glad you found the St. John's wort at the well, and the unusual orchids the flowers and bees were amazing. Thank you for a lovely day on Sunday. I enjoyed the day and found it very interesting. Thanks again for everything we enjoyed the trip and certainly had some great laughs. Our favorite place there was the farmer’s land and the fairy circle in the Burren. I really enjoyed the day- so many amazing places I did not know about even though I am living close by, so much interesting information and so many new things I did in great company!